BBC NEWS | Business | Is it last orders for friendly societies? Is it last orders for friendly societies? 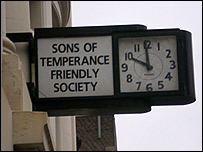 It is opening time at the Sons of Temperance Friendly Society. Perhaps surprisingly, Mary Scroby, the chief executive of the society, opens the door of their imposing HQ on the Blackfriars Road in London herself. She is the only full time member of staff. Clearly this isn't a financial rival to Barclays, Standard Life or even a Derbyshire Building Society. No surprise, really, because the Sons, like many of the UK's 50 plus friendly societies, is a bit of a relic. Friendly Societies have been around since the middle of the 19th Century. They were formed as localised financial co-operatives which helped members save for things that, post-welfare state, we now take for granted - such as the costs of seeing a doctor or getting buried. For example, Ms Scroby's family joined in the 1920s. Her grandmother paid a penny a week in return for access to a free doctor. Friendly Societies were often localised and associated with a particular industry or religious grouping. This can be seen in some of the friendly society names like the Metropolitan Police, Bus Employees, Original Holloway, even the Grand Order of Israel & Shield of David friendly societies. As you can guess from the name, the Sons particular unique point is temperance - abstention from alcohol. New members are asked to pledge "not to use as a drink any alcoholic beverage". Ms Scroby admits that in binge-drinking Britain temperance is not much of a marketing lure. "We did discuss abandoning the pledge a few years back but our members chose to retain it. "From a new business perspective the pledge is not that attractive." Looking at the membership figures, this is a bit of an understatement. The Sons has about 8,000 members and total of assets £3.4m - enough, perhaps, to buy two townhouses in London's Chelsea. In each of the past two years just seven people have taken the non-drinking pledge and joined. The financial reality facing the Sons is stark. The few thousand members - most of whom joined before the Second World War - will eventually die out and they are not being replaced. 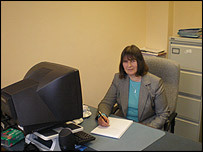 Mary Scroby sees her role as a "custodian"
So it seems that Ms Scroby, as chief executive, is managing a slow-wind down of the society. But she isn't depressed, seeing her role as a "custodian". "We offer a lot to our members there is a social and fraternal aspect to the society. In addition, there are financial benefits. "As our members do not drink they tend to enjoy longer, healthier lives. Last week, for example, I paid out a life policy on someone aged 107. "This means that we can give them better life assurance rates." The remaining members also socialise together at an annual outing - this year members went to Woburn safari park. And the Sons' HQ is chock full of history. A quick glance around the oak-panelled boardroom and you come face to face with previous chairmen of the society, dating back to the 19th Century. Most are men, all wearing a medallion of office but there is the odd woman thrown in. "I am afraid we had to wait to the First World War for our first woman," says Ms Scroby. But it may well be a case of last orders for the Sons of Temperance soon, despite the fact that some friendly societies are flourishing. Take Liverpool Victoria Friendly Society for instance. Liverpool Victoria sells all types of insurance products and even offers banking services. It is far from small fry with assets worth £8bn and a major sponsor of UK sporting events. But you have to really trawl their website to find a mention of their friendly society status and there is no sign of day trips to safari parks. Nigel Snell, Liverpool Victoria's communication director, denies that the friendly society moniker is redundant. "We are very proud of our friendly society heritage going back to 1843. "People who understand friendly societies value them - a more caring approach. "It says something about the strength of the friendly society proposition that small societies survive, it is the localism which counts," Mr Snell said. Liverpool Victoria is not the only society making strides to get to the big time. The Children's Mutual, with its focus on supplying child trust funds, is bringing in lots of new business as are Royal Liver and Scottish friendly Societies. As for the others, they can draw some comfort from a little-publicised tax break. Most people know that they can invest up to £7,000 a year tax-free through an Individual Savings Account. But did you know that you can save a further £25 a month with a friendly society tax-free? However, Ms Scroby's view is that the big guns in the sector are aping everyday insurance companies. "People think Liverpool Victoria and the like are insurance companies. Knowledge of friendly societies is not widespread...in our case, for example, people often think we are associated to the Quakers - otherwise known as the Society of Friends," she said. And if friendly societies continue to wither on the vine then their ethos - corporatism, non-profit and a sense of shared community - may well be lost.